WinRHIZO is an image analysis system specifically designed for root measurement in different forms. It can do morphology (length, area, volume...), topology, architecture and color analyses. It is made of a computer program and image acquisition components that can be combined to meet different needs and budgets. WinRHIZO automatically or interactively analyses washed roots. The root diameter distribution graphic displays the root length, area, volume or number of tips as a function of root diameter or color. The number and the width of the classes are user-definable and can be changed at any time. 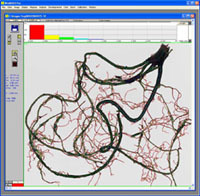 WinRHIZO displays the analysis over the image. The color used to draw the root skeleton indicates into which diameter class the part of the root has been classified. The same color is used for drawing the root distribution graphic above the image. Measurement data of the sample under analysis is summarized on screen and is available in detail in data files.